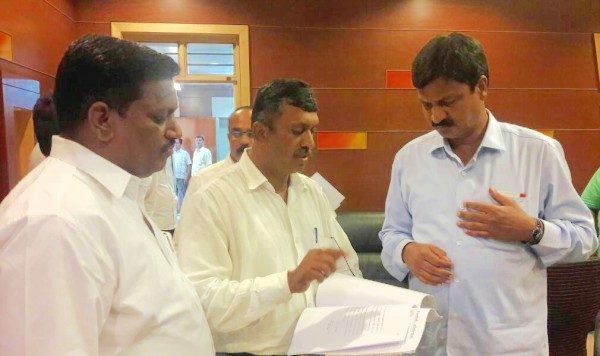 Vinayak Gunjatkar, Chairman of Standing Committee for Town Planning & City Improvements raised the issue of Gomatesh Vidyapeeth encroaching a road in Hindwadi with the District incharge minister Ramesh Jarkhiholi on Thursday. He requested the minister that no action was been taken by the corporation even after repeated requests. Gunjatkar said if the said illegal shed is not demolished within a week he will go on a Dharna at RPD corner along with his supporters. Answering the minister said he will ask the DC and corporation to demolish the said illegal structure and if same is not demolished then he too will join Gunjatkar in the Dharna. This issued was raised at the general body meeting held in April as well and then MLA Sanjay Patil spoke up and said that there are many encroachments in the city first remove them and then come to remove mine. This very sad to know that the dist incharge minister is helpless. THE MLA SHOULD COME FORWARD AND SET AN EXAMPLE SO THAT THE OTHERS CAN ALSO CO-OPERATE IN REMOVING THE ILLIGAL CONSTRUCTIONS IN THE SMART CITY. Yes even there is illegal construction going on at maratha colony and it’s causing distruban to beside house if law and order are not true than anybody can construct any how. No proper space left between two residents​ and only power speaks. This is Congress Raj .